I remember being pregnant with my twins and thinking I had it all figured out. I had a birth plan all written, and I pretty much knew exactly how my birthing experience would be. I had been on bed rest for contractions for months, and thought for sure that being induced would not be a decision I would have to come to. We had spent months fighting to keep them inside, so I figured they would just crawl out when the time came. Boy was I so wrong. Thirty seven weeks was our golden number. When that week came my doctor was in shock that we made it that long. He took me off bed rest and told me to get out on the streets and walk my heart out. I probably walked forty miles in a few days. I was determined to get those babies out naturally. I continued to have endless contractions in my journeys on the streets, but every time I would go back into the office he would check me and I hadn’t even dilated at all. By the end of the week, and with no progression my doctor scheduled my induction. Both babies were head down and I kept my fingers crossed that my natural birth plan I had fought so hard for would be carried out, despite my set back of being induced. I was frustrated as the next day rolled around and my scheduled induction was up. I walked in the hospital, a little deflated that the first bullet point in my designed birth plan would not be happening for me. It was early evening and my doctor began the process. He said it could be fast, but most likely I would see slow progression throughout the night. The next morning came and went, still no babies. My contractions were consistent, but barely any progression still in my dilation. My desire to continue my natural birth plan kept me hanging on with no drugs other than the Pitocin to create stronger contractions. They would up the Pitocin every few hours in a hope to see more progression. The pain was almost unbearable by early afternoon. Every time the nurse or doctor would check me they found I had progressed very little. Nurses would beg me to get an epidural or take some pain meds, but my stubborn nature kept me driving to keep up the fight for my natural birth. By evening I was in so much pain that tears would roll down my face every time I had a contraction. The Pitocin was turned up so high that my contractions were only about a half of a minute apart, so I had little breathing time in between. There came a point when baby B began to panic. Every time a contraction would start, her heartbeat would plummet. It was like the contractions were causing her to go into a panic attack. Her heart rate would drop dramatically and then would become very sporadic through out the whole contraction. A half an hour after the epidural was in place I got the urge to push. I told the nurse who almost laughed, “Remember when we just checked you, and you were only a three . . .” Finally I talked her into getting my doctor, and sure enough— I was at a ten. They rushed me to the operating room. Since we were having twins, it was that hospital’s practice to deliver in the OR. As soon as I began to push baby B’s heartbeat would almost stop. After a few more pushes my doctor started to panic, “We have to get that baby out of there!” He grabbed his tools and suctioned baby A’s head right out. She was beautiful, she had a healthy cry, and she looked perfectly pink—well perfect except for the little red yarmulke that had been left by the suction machine. For what seemed like an hour no one said a word and all the nurses and the doctors were gathered around our baby. I felt like I was in a dream as my heart cried out, “Heavenly Father, please, help this baby girl. Please help her keep up the fight and make it through.” I sat frozen with my head in my hands. Every things seemed to be in slow motion. All the nurses scrambling—no one looking me in the eye. And then it came . . . the loudest baby scream I had ever heard. It was as if she was answering my prayer, “Mommy, I am not only here . . . I am a warrior, I wasn’t going to give up that easy. I am a fighter!! !” The sound every mother waits for. They rushed the twins off to the NICU while I caught my breath. She was a fighter—just ten minutes into her life and we had learned a lot about our little twin . . . Bostyn. She wasn't going to give up. Fast-forward a few years. Emmett is in law school at Gonzaga. Bostyn is four years old. 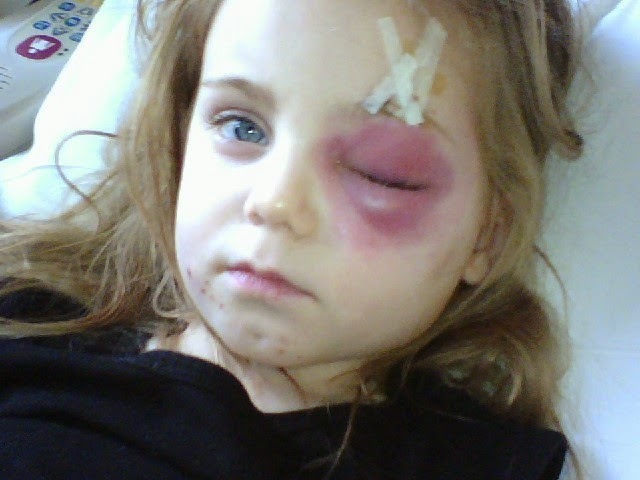 We were at church one Sunday afternoon and Bostyn comes into my class crying with blood running down her eye. I took her into the bathroom and cleaned her up a little bit. A few nurses who attended our church took a look at her and suggest I take her to the little 24 hour clinic close by. I took her in, they threw some glue in her cut and sent us home. Easy enough. That night Bostyn woke up screaming. I tiptoed in and reminded her that her eye was just sore from her cut. She went back to sleep for a few more hours. At 1:00 a.m. she was screaming again. This time I flip on the light and run over to her bed. 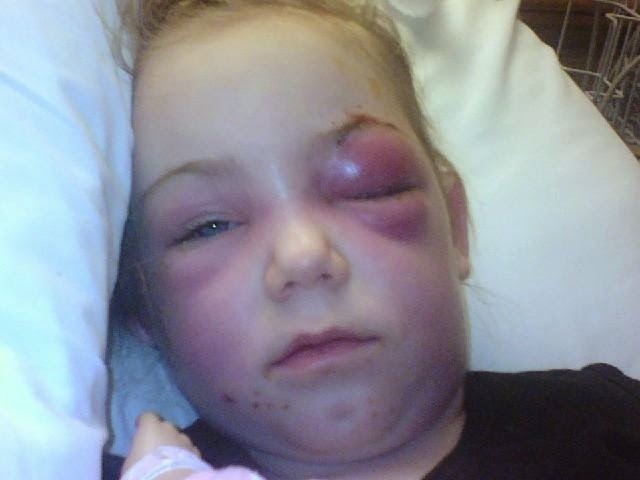 Her eye was the size of a baseball and totally swollen shut. Emmett ran her into the hospital, which was an hour away. For the first few days they treated her for a MRSA staph infection. By the second night Emmett and I were sitting in the room watching the infection spread like wildfire down her neck, and over to other eye. By this time she couldn’t move her head and could barely see out of her only open eye. Doctors kept reassuring us that it would start to go down, but as the evening turned to night we all started to panic. Doctors began coming in to schedule surgery for the next morning to start to drain her neck and try to get rid of all the infection. I remember at one point stepping out in the hall and pacing the floor. My baby, who had an identical twin sister, was going to have scars all over her neck and face, or worse . . . they weren’t going to stop the infection and she wasn't going to live. I felt worthless— I was right there, and I couldn’t do anything. I couldn’t save my little girl. I paced the hall for twenty minutes searching for an answer inside of my mind. Nothing came. As I whispered in my mind my final AMEN, words began popping into my head. I almost ran down the hall. I wasn’t sure where I was going, but I knew exactly what I was going to say. I finally made it to the nurses station and with a power not of my own I began shouting out demands and pointing at people, “You are going to call the infectious disease specialist . . . You are going to go order this test to make sure this infection has been properly diagnosed . . .” I don’t remember much more of what I ordered that room full of nurses to do, but I do remember by the next morning many specialists had entered her room, prescriptions were changed, and Bostyn could move her neck and see out of her good eye. She didn’t have to have the surgeries or have draining tubes inserted. That day I fought . . . for my daughter’s life. I fought for a power to send someone to help save her, and I was given the words to command the right people to come our way. Sometimes we fight for a purpose, and sometimes we fight for a fear. About three months after we got married Shawn and I had our first big fight. He came to me one Sunday morning and said he was going to go to the drag strip to race his jeep while we were at church. The minute those words left his mouth here is how my mind worked: He obviously doesn’t care about me; He is willing to break a commitment he made to me about what we would spend our Sundays doing; He doesn’t care about my feelings; He doesn’t care about the example he is giving my kids; If he can be easily swayed on our simple commitments to each other then one day some girl will talk him into walking out on our big commitments; He will leave us; He will cheat on me; Then he will be murdered in a dark parking lot for sleeping with another man’s wife. Boom, boom, boom . . . Within a fraction of a second the scenario my mind created was flaring red flags through my entire body. He can’t possibly choose a choice I don’t agree with, or else he doesn’t care about US. He can’t use Sunday for racing his jeep, or he is not going to be a good dad. He is going to abandon us. My kids deserve a perfect example in every way; we don’t deserve THIS. I guess he didn’t want to marry me in the first place. If he can’t even keep his word on something as simple as how we will spend our Sundays, he is never going to make it. By the time he walked out the door to leave I was like a volcano spewing with all the fear of my past, and the imagined pain in my future. I ran out into the garage and like an idiot rattled off every fear that had crossed my mind, “Shawn . . . I thought you were the kind of father that would give these kids a good example . . . I thought you were going put their need to see a good husband above your stupid ideas like white trash drag racing. If you can’t even give up a simple thing like what Sunday activities you would rather do than go to church, maybe MY kids and I deserve better than this.” My eyes burned with all the fear that was driving my words. Did he even love me? Did he really want to be their dad? In that moment I could not detach his desire to make his own decision about how he would spend his time that day, from his willingness to love my kids and me. As he should have, after getting berated by his crazy wife, he left. I watched him drive away and I felt like a piece of me died again. My mind went back in time to Emmett telling me he was going to leave and run to Walgreens. I could almost feel my soul scream, “Don’t go . . . please . . . something is wrong. Please just stay here with me.” I could feel the toxic shock of fear wave through my entire being. Emmett had left when I felt he should stay—and he died. How could Shawn do this to me again? Was he ever going to come back? Was today going to be the day when some normal, healthy, not broken girl would come and show him all that he was missing? Or would it be the day when deceit would come his way and drive him to his death? The thoughts that overtook my power seemed as real as the car that had just sped away. How could he say he loved me if he didn't even want me to be a part of his decisions? If he couldn’t see how important it was to me for him to go to church with us, why would he not chose my choice? How could he come back and be a father now if he wasn’t perfect in everything he did, or in the promises that he had made? If he was going to disappoint us, maybe it would just be easier to walk away. If I wasn’t worth making good decisions and fighting for, maybe we were done. My fear of losing him was trying to get me to believe I no longer wanted or needed him. I truly thought we would get divorced that day—either because of my unwillingness to accept his personal choices and imperfections; or because of his unwillingness to include me in his decisions and follow the simple commitments we had promised each other. He was only gone forty-five minutes. He later told me that he drove to the racetrack, determined to show me that he could do what ever he wanted without “asking permission”. He said as he pulled up to the track he sat in his silent car for a half an hour struggling with the internal battle of what to choose. He too felt the overwhelming feeling to just give up that day. To stop fighting for what we had been building, and stop trying to carry such a heavy load that had been placed upon us. By the time he walked in the door we were both a heated mess of fear. We battled all afternoon back and forth. I was determined to show him that his stupid choices could ruin our family some day; and he was determined to show me that he had to be able to make his own choices and still be loved regardless of if they were perfect or not. We both had very valid strong points, but this day neither of us could look through our own pain to see the other’s fear. The crazy cycle is a wonderful definition of what we were in. My fear of living the past over again urged me to try to push Shawn into making all the right decisions— for me. His fear of feeling mothered and control caused him to want to make his own decisions— just to make sure he still could. I don’t know about other blended families— but for ours when a major argument would happen, it seemed our natural reaction would be to walk away. We both had felt like we had been through enough in our first marriage, that this was supposed to be our easy one . . . right? Any heated fight we would have, even about simple things, would somehow end with one or the other of us thinking or saying that maybe we made the wrong decision to marry each other. Maybe we would be better off alone. It was like no matter how many good days came our way, the minute contention showed up on our doorstep we would want to abandon any of the hard work we had made in our marriage. It seemed we would just give up the fight and walk away. At times, blending two families is difficult. You both come into the marriage with fears from the past. Whether divorce or death— your past has been hard, and therefore your new marriage has many challenges right from the beginning. Fears are powerful especially in new families that have come from a broken past. The power of your pain can ignite at any given moment. For us in the first few years . . . it happened often. Sometimes the strength of passion can help us overcome and fight through; but other times the weakness of passion can hold us back and hinder us in our progression. Shawn and I have come a long way since that day, but we haven’t stopped fighting. But now, more often than not . . . we fight on the same team. We are passionate about our family, we fall victim of fears, but a few things have changed . . .
One day our crazy cycle was in full force. The kids were all downstairs and we were up in our bonus room going back and forth over something about parenting. It was going nowhere fast, and neither of us was willing to compromise our stand. All of the sudden Shawn said, “Ash . . . stop. Get on your knees.” We knelt down together and Shawn offered the sweetest prayer. He asked that the dark feeling in our home could leave and that we could see each other’s point of view. I wish I could say that that magic moment has cured us of the urge to nitpick the way we parent each other’s kids, or the way we baby our own . . . it hasn’t! I wish I could say that at times we both don’t want to run away and that we are the perfect blended family—we aren’t. But the prayer on my knees with my husband was a powerful reminder that God can help us even when we can’t see what things are worth fighting for. We are all fighters in one way or another. Some are fighting for their lives; others are fighting for their country. Then there are some of us who are fighting for a cause we don't even know. Sometimes we forget what we we are fighting about, and other times will never forget the fight that got us through our battle. We were born to be fighters. Just like my daughter Bostyn who fought her way into this world, we all have the desire to win and succeed. But what if we are fighting for the wrong cause? What if all the fighting we are doing alone is only getting us farther away from what we really want? Every good fight starts with a drive, a powerful force of motivation: Fighting for your little girl in a hospital bed; fighting your own battle with cancer. Some fight their way out of addiction or depression. Some are fighting their way through an imperfect relationship. Sometimes the victor will have to walk away and not look back, and other times the win may come as they have to hold on— even when they can’t remember why they are there. No matter who we are, we will have to fight a good fight. Every good fight ends with love; every bad fight ends with hate. Fighting as a team will get us a lot farther than fighting alone. Sometimes our fight can change the world, and other times our fight will merely save ourselves. There is a battle raging in each one of us, a fight for good and a pull of evil. Not every fight is worth dying for, not every motivation a good cause. Not every fight will be viewed; some battles are never seen with the human eye. We are all warriors from the battles we have won. We are all soldiers when we battle with grace. We all have the power to be our own captain and know when it is time to just let go of a fight that can never be won, or pilot ourselves to a battle worth saving. Don’t lose yourself by fighting a fight of destruction. Some battles only rage because of a fear of losing. If it were easy, it wouldn’t make us grow. Life is going to be full of battles, good and bad. Whatever fights you are hanging on to, make sure they will bring you up. Fight for the battles that are worth winning, and let go of the battles that are worth losing. Fight for a cause you will never lose. You are not fighting alone. I always love reading what you have to say :-) having a blended family of our own I can totally identify..we always fight for US! My sister's baby A had nearly the exact same complication. He had a 20% chance of surviving and they're not sure how he received enough nutrients to grow. Long before he was born, his name was to be Jesse. It wasn't until a couple months after he was born that Jesse means gift. His twin's name is Jace and that means healer. Twins are beautiful and terrifying but there is no doubt of the divine love and miracles that come about. Jesse is, beyond any doubt, a gift. I can't imagine our lives without that flirty, little baby. Perfect timing! Blended family. Hard. Struggles. Want to quit. See your post! Thank you! Beautifully written Ash...I remember those terrifying days in the hospital. So glad things worked out the way they did. I love you all so much and am grateful for your open and honest account of your life experiences! Ashlee, thanks for your blog and sharing your life with us! I am crying as this post really touched me! Thank You! P.S. I think you and Shawn are adorable together and you look like a perfect match together!! This past year has been one of the hardest of my life. My kids are no longer under my feet, off to school all day. I have to make something of myself. And depression tells me to stay in bed all day. About 5 months ago, the word 'fight' started to ring through my mind as I got up each new day. Over the years, I've had different phrases or such come to me at particular times in my life but this last one seemed to surprise me, very poignant, that it was up to me whether I would win it. I have to 'fight' for my life. I lost 2 brothers who committed suicide, who gave up the fight. And so many times this past year, I have been at war with myself. Thank you for sharing your struggles, the pain and fear. Your words can help others to know they're not alone. Once again you have proven the beauty and great worth of your family!! !